Little Miss Sunshine is a chamber musical with book by James Lapine music and lyrics by William Finn and direction by Mehmet Ergen based on the 2006 Indie movie with the same title. There are no many families who are quite as odd as the Hoovers: Olive Hoover (Evie Gibson/ Lily Mae Denman/ Sophie Hartley Booth) is the cutest little girl in the world. She aspires to the coveted title of Little Miss Sunshine. Her dad Richard (Gabriel Vick) is a bad motivational speaker and not a great role model, her mum Sheryl (Laura Pitt-Pulford) is very permissive, her brother Dwayne (Sev Keoshgerian) hates his life and has taken a vow of silence, her grandpa (Gary Wilmot) uses drugs, and her uncle Frank (Paul Keating) has shown up on their doorstep after a botched attempt to take his own life, after his boyfriend has left him. This motley family is about to make a 700 mile trip in an old van to get Olive to the National Little Miss Sunshine beauty contest in California. Along the way, give us quirky vignettes, alternately endearing and humorous, and a corny ending - and the show is done. 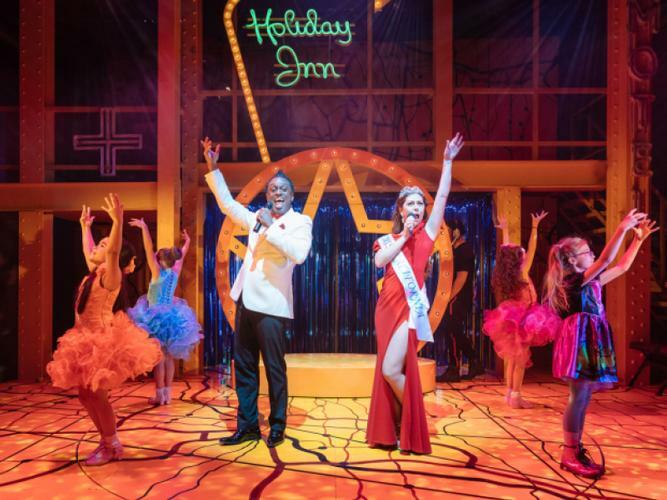 The musical is genuinely funny at times, with great performances - especially by Laura Pitt-Pulford, Gary Wilmot, Sev Keoshgerian and Imelda Warren-Green- and intelligent use of the relatively small stage. Even if Little Miss Sunshine has a goofy plot about an improbable, weird family, cartoonish situations, rushed moments and forgettable songs, it will be much appreciated by the die-hard fans of the film (I could hear the reactions of audience members around me who knew the plot twists in advance) and by anyone who just wants to stop thinking about Brexit and just have an easy night fun at the theatre. It runs until 11 May before heading out on a UK tour.